Common names: Wild Fennel, Fennel, Sweet Fennel. Plant description: Fennel is a biennial or perennial plant, with a thick white-colored root stalk and stout, erect stems that are round and striated. It can be quite vigorous, attaining up to a height of between 1 and 2 meters. The plant is characterized by its smooth almost polished look, and its bright bluish-green color. Arising from the upper stem are many branches that bear deeply cut leaves, alternate and triply pinnate, leaflets acute, and petioles with a broad, sheathing base. Fennel flowers in summer, from July into September, in large, flat terminal umbels, with numerous smooth, angular, rather stout rays. The corolla of the flower is comprised of five golden-yellow petals. The fruit is dehiscent achene, ovate, about 5-8 mm in length and 2-3 mm across when dry (Grieve 1971, 294-5; Felter and Lloyd 1893; Cook 1869). Habitat, ecology and distribution: Fennel is stated to be a native of southern Europe or perhaps northern Africa, growing wild upon sandy and chalky ground. It has long been domesticated however, and is a frequent representative in household gardens, and is sometimes an escapee, found in abandoned fields and pastures. It is cultivated widely throughout the Mediterranean and the Balkan states, as well as in India, China, and the Americas, preferring warmer climates. There are a variety of very similar species (e.g. F. capillaceum, F. officinalis, F. dulce), some that can be found growing wild, as well as a number of sup-species and varietals that have been cultivated over the years (Felter and Lloyd 1893; Weiss 1988, 68). Part used: Seed, flowering tops. As Fennel rarely flowers all at once, and other Fennel plants are flowering at different time, collecting the seed for drying is a patient discipline. History: Fennel is mentioned as early as 3500 years ago in the Ebers Papyrus, an ancient Egyptian medical manuscript, in the treatment of flatulence. During archeological excavations Fennel seeds were found in the tombs of ancient Egyptian pharohs. Similarly, Fennel was used in ancient Greece and Rome, not only as a medicine but as a vegetable and cooking spice. Its Greek name marathron apparently derives from the root word marino, which means ‘to become thin’, suggesting it was used in the treatment of obesity. Pliny (23-79 CE) describes the virtues of Fennel, and mentions it in no less than 22 different formulations, primarily as an aid to digestion. It is the Romans who introduced Fennel to the rest of Europe, and despite an additional effort by Charlemange to spread its cultivation throughout Europe, the British hasten to point out that it had been used in Anglo-Saxon cookery prior the Norman invasion in 1066 CE. In the Middle Ages Fennel became an important supernatural remedy against witchcraft, hung over doors on Midsummer’s Eve to ward off evil spirits (Pahlow 1993, 167; Grieve 1971, 294; Mills and Bone 2000, 378). Constituents: The chemical constituents of Fennel can vary depending upon the species or subspecies. The primary constituent of interest is Fennel’s essential oil, which is upwards of 2-4% of the total constituents, comprised of the sweet-tasting transanethole (60-80%) and estragole (5-10%), as well as fenchone (5-7.5%), limonene, phelandrene, camphene and pinene. Other constituents include tannins, a fixed oil, stigmasterol and coumarins (Mills and Bone 2000, 379; Mills 1991, 424). • Antispasmodic: Fennel essential oil and extracts of Fennel have demonstrated antispasmodic activities in experimental models using isolated smooth muscle. This action appears to be related to an effect upon calcium metabolism. Anethole is stated to be chemically similar to the catecholamines adrenaline, noradrenaline and dopamine, and as a result Fennel can exert a sympathetic activity, such as bronchodilation, or as its Greek name suggests, weight loss. The activity of Fennel upon pentobarbitone-induced digestive immotility in rabbits was reported to be active within 30 minutes, via cholinergic mechanisms rather than a direct stimulation of smooth muscle. In human clinical trials polyherbal formulations that include Fennel as primary ingredient have been shown to exhibit a superior antispasmodic activity when compared to the drug metoclorapramide, improving symptoms of pain, nausea, belching and heartburn. Similar studies on infantile colic have demonstrated that traditional herbal digestive aids that include Fennel are superior to placebo (57% vs. 27%), and are well tolerated (Mills and Bone 2000, 380). • Respiratory: Fennel oil administered by inhalation has been shown to exhibit a mild antitussive effect on cough stimulated by mechanical methods in experimental animal models. Anethole and fenchone were shown to enhance the expulsion of respiratory tract fluid, and displayed a mucolytic activity (Mills and Bone 2000, 381). • Antimicrobial: Fennel oil exhibits an in vitro antibacterial activity comparable to many common antibiotics, such as penicillin and tetracycline, against a range of potential pathogens, including E. coli, Strepococcus pyogens, Staphylococcus aureus, Mycobacterium avium, Bacillis subtilis and Proteus vulgaris (Mills and Bone 2000, 380). • Endocrinal: Fennel is reported to exhibit a positive effect upon lactation, improving the volume of milk produced and its fat content in goats and mice. 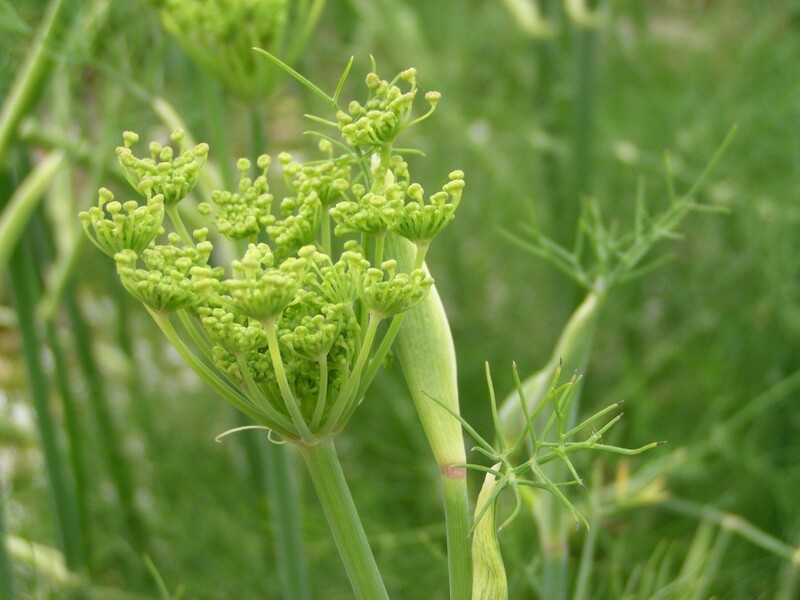 An injection of Fennel oil in sexually immature and ovariectomized mice was shown to trigger the mating response, and has been observed to stimulate the growth of mammary glands and female reproductive tissues, and in general, enhanced the chance of conception. In male mice however, Fennel oil was shown to exhibit an antiandrogenic activity, with an increase in the size of the seminal vesicles and prostate. The chemical similarity of anethole with dopamine may explain why Fennel enhances lactation, competing for receptor sites and generally down-regulating the inhibitory activity of dopamine upon prolactin secretion (Mills and Bone 2000, 380). Toxicity: The LD50 for Fennel oil in animal studies have been observed at ranges from 3.12 g/kg to 4.5 mL/kg. The oral LD50 for anethole in rats is stated to be 2.09 g/kg (Mills and Bone 2000, 380). Contraindications and cautions: Mills and Bone state that Fennel is a possible “spice-allergen,” affecting predisposed individuals with inconvenient but generally mild symptoms (2000, 380). The use of Fennel during pregnancy may be contraindicated, as it is in women with a history of estrogen-dependent cancers, due to the estrogenic effects of the oil. Medicinal uses: Both Fennel and similar members of the Apiaceae such as Caraway (Carum carvi) and Dill (Anethum graveolens) have a long history of usage in almost all the major traditions of healing. And, perhaps not unremarkably, Fennel’s usage as a digestive aid is consistent throughout all of them, and as a result there should be no confusion about its specific uses. Fennel is an excellent example of an aromatic herb that works to re-establish normal digestive activity. In general, aromatic herbs act to open the channels to allow the vital energy to flow. Using the Thomsonian model of the wood stove, Fennel is like the vent that allows more air into the stove, enhancing the intensity of the fire. Thus Fennel is not so much a stimulating herb as it helps to regulate digestive secretions. In general this ability manifests as an inhibitory response, and thus Fennel is commonly used in gastric hyperacidity, or in greenish diarrhea from excessive bile. Fennel however also acts in asthenic states, stimulating the appetite, used in the treatment of anorexia, constipation, with dry hard feces and spasm. The wide range of its regulatory activity is seen in its somewhat contradictory but traditional use in obesity, where enkindling the digestion and metabolism are also warranted. Perhaps this effect is also due in part to anethole as a catacholamine analogue. Fennel is not the most potent of the umbelliferaes, but with its sweetish tasting essential oil, is certainly the most pleasant, and is well-liked by most children and adults. In the treatment of respiratory diseases Fennel can be of great assistance as a mildly active antimicrobial agent in infection, and is a useful expectorant and mucolytic. Fennel is also used in formulations to mediate the effects of the other botanicals in the formula (once again a ‘regulating’ activity), to stimulate the uptake and metabolism of its ingredients, and of course, to enhance patient compliance. A somewhat more recent manifestation of its use is as a ‘mammogenic,’ commonly found as a primary ingredient in multi-level marketing products for breast enhancement. I have talked to at least four women who said that their breasts increased by more than a cup size after taking such products, a result which may seem unbelievable, but does have some support in the medical literature (see Medical Research). While I have never personally seen Fennel increase breast size in patients, I have never attempted to use it for such purposes. At this point, when we know so little about the role of plant-based estrogens in human health, it seems unwise to be actively using them to modify estrogen-sensitive tissues simply for aesthetic purposes. Estrogen-dependent cancers in women appear to be on the rise almost all over the world, and while small amounts of phytoestrogens in the diet or in medicinal herbs is generally quite safe, using them in large amounts for non-traditional purposes will more likely backfire than not.